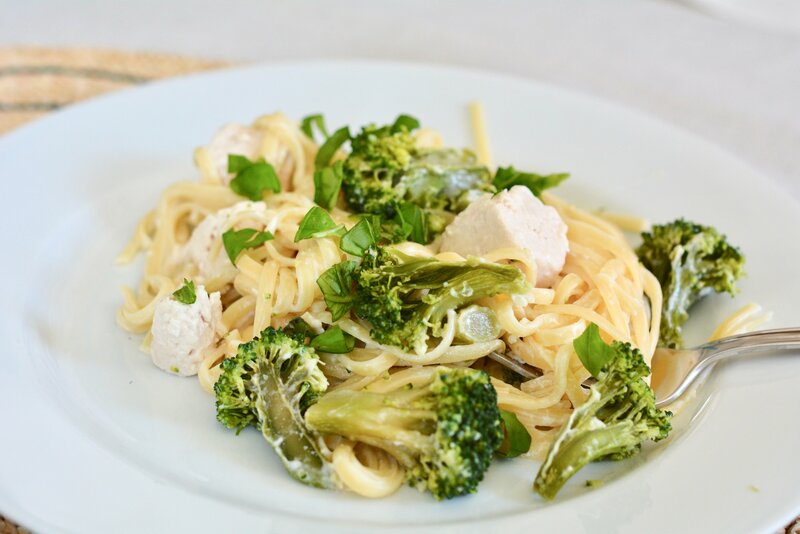 This recipe for Chicken Alfredo Pasta with Broccoli is a weeknight sanity saver. Everything is done in the same skillet, from the browning of the chicken to the cooking of the pasta. You can’t go wrong with having to clean just one pan! 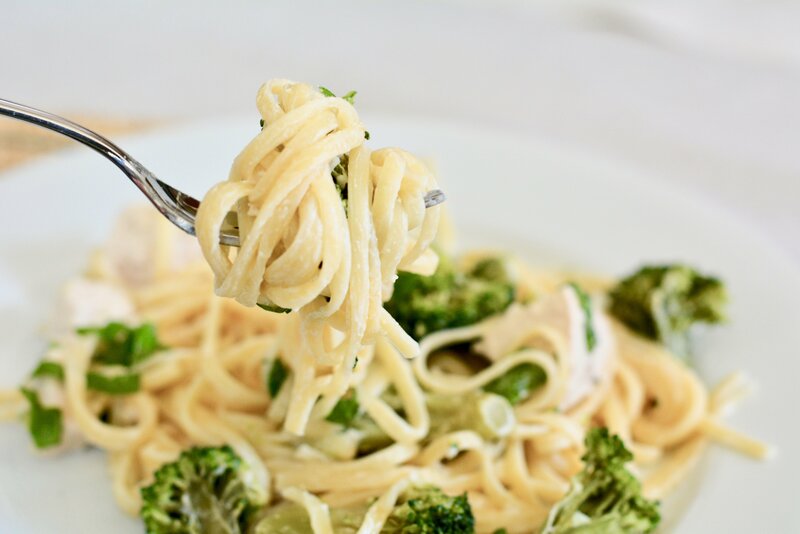 And here’s something else: my kids will inhale any variation of pasta with cheese so they don’t complain about having to eat a green veggie — broccoli — along with the chicken and cheesy pasta they love. I even double the recipe so the kids can bring a hot lunch to school. Dinner and lunch done in one night in one pan? Yup. Looking for a one pan mid-week meal? Follow my recipe below! 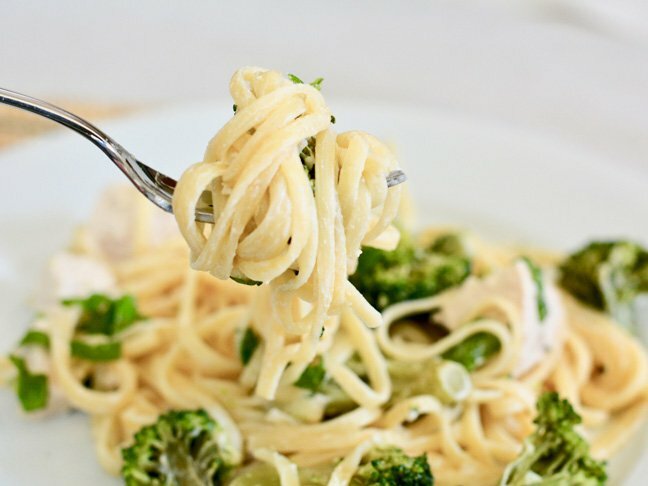 This classic favorite is so good -- and our recipe includes broccoli, too! Step 1: In a deep skillet, add the olive oil, garlic, and chicken breasts and cook them over medium heat until the chicken is lightly browned and cooked through. About 5 minutes. Step 2: Add the broth and cream to the skillet and add some salt and pepper to taste. Then add the linguine (you don't need to boil the linguine first). Cover the pan and bring the mixture to a high simmer and cook for about 10 minutes. Step 3: Carefully add the broccoli to the mixture and cook for another 10 minutes, or until the pasta is fully cooked. Taste for flavor and add more salt and pepper if necessary. Add the Parmesan and mozzarella into the pasta, stirring until it is completely smooth and creamy. Transfer the pasta to 4 plates and top each one with a sprinkle of basil. Serve hot!